She has come from the sea, and he, all uncomprehending, can only wonder. His flock continue to graze on the salty grass of the coastal dunes, but he, the normally-attentive shepherd, has already forgotten their existence. Unawares, he sinks to his knees, suddenly suspended in a world between the commonplace of the everyday and a larger reality in which anything can – and does – happen. She strides confidently out of myth, crossing the impossible space between the waves’ edge and the intervening sand, wading across a shallow lagoon to confront him. Her golden hair, decorated with strands of marine plants, flutters in the sea breezes as it must have fluttered in the more measured rhythms of the currents beneath the waves. She is no more aware of her nakedness than he now is of his surroundings. Her presence is more real than his reality. His water flask also lies forgotten on the ground at his side, and his shepherd’s crook, the emblem of his task, is grasped in his now-unsteady hand. In her pale hands she holds a shell, and her simple gesture indicates that this is her gift to him. No word is spoken, for none is needed. Were she to speak, her language would perhaps be incomprehensible to him, as his earthly dialect might be to her. So she does not speak. And he cannot, transfixed as he has become by her miraculous appearance in his world. All that he can do is extend his wondering hand to receive this offered gift from the sea, barely aware of his own gesture of acceptance. She smiles down at him, seeming somewhere amused at the consternation which she has caused, but comprehending as well, compassionate in her invasion of his reality. For a moment, for a brief sliver of time, her fingers brush his own as he takes the shell from her, and he feels an impression of pale skin more silken than human skin could be, like the smooth pelt of a seal. Now she smiles at him, gesturing with her hands, cupping them to her ear to indicate what she wishes him to do. He obeys, holding the shell to his own ear. Entranced, he hears it: the slow murmur of the deeps, the tug and sigh of currents, the restless, wandering voice of the eternal ocean. He closes his eyes, surrendering to the sound, listening, listening. He has no wish to open his eyes now, understanding what will happen when he does. But he must, and eventually, he does so. She has gone. 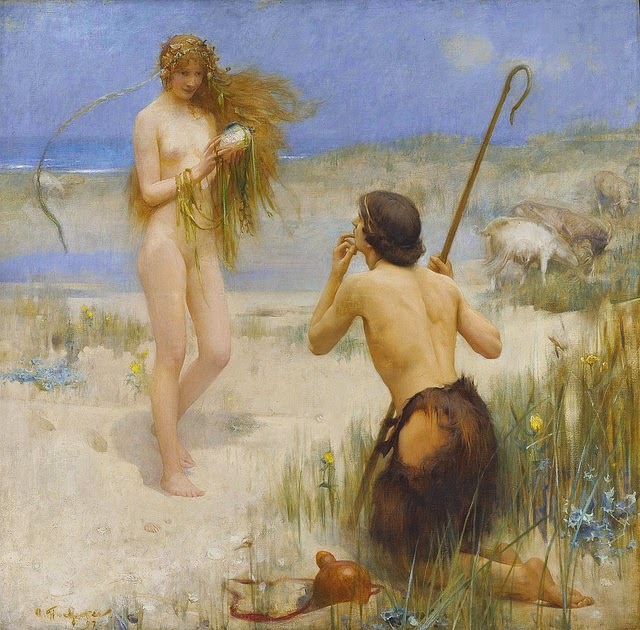 Painting: The Sea Maid by Arthur Hacker.